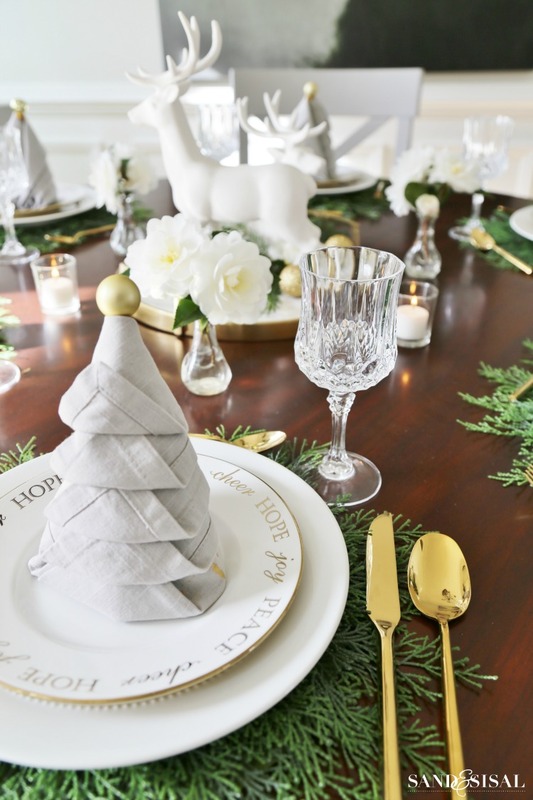 This week 30 bloggers are sharing a beautiful variety of Christmas Dinner Tablesetting Ideas as part of a fun and creative Styled + Set Holiday Entertaining Blog Tour hosted by Designthusiasm. The full list with links to everyone on the tour for each day are listed at the bottom of this post. If you are stopping in from Maison Decor then welcome! 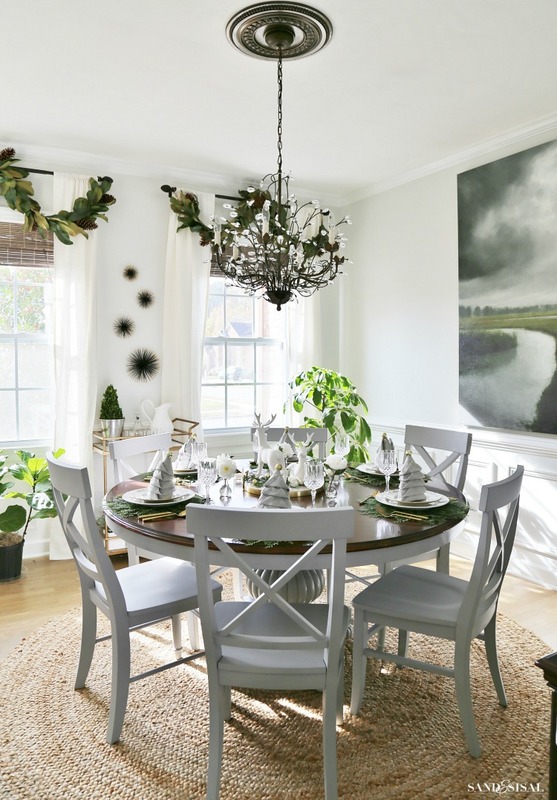 Now that our dining room makeover is complete, I was excited to dress it up for the holidays! 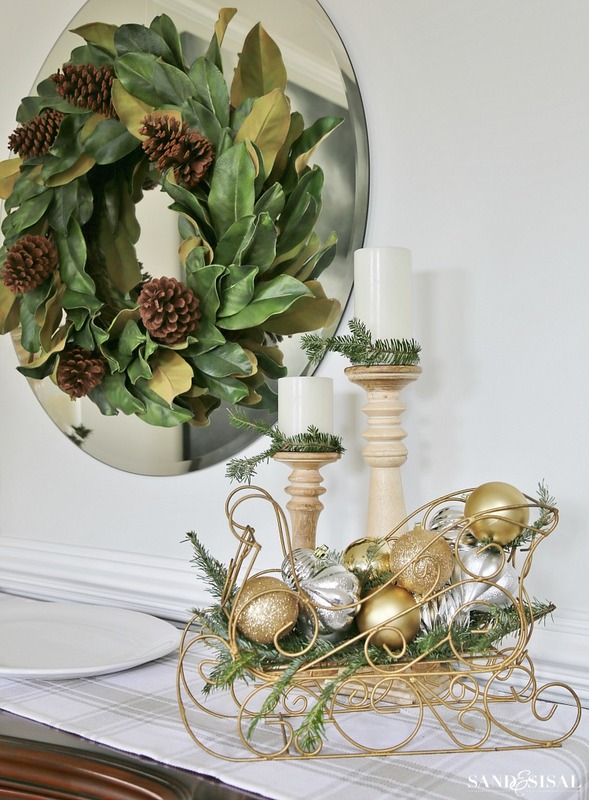 This years decor theme for the room is silver and gold with crisp white and greenery. 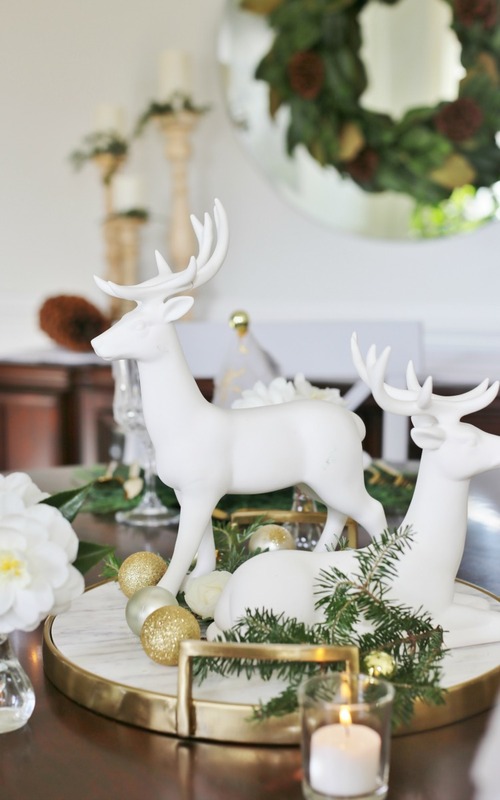 What I love about these Christmas dinner tablesetting ideas are that they create the look of a fancy table but are rather easy to put together without a lot of fuss. In lieu of a tablecloth this year I chose these fun Cedar Branch placemats from Pier 1. They look so pretty real and give a natural, woodsy vibe to the table. Gold flatwear is all the rage this year. I remember when it was a big trend back in the early 90’s. This particular stainless steel flatware set is from Target. Believe it or not but I don’t own any formal china. Maybe someday I will but I’ve gotten away without needing any for nearly 25 years of marriage. I like to dress up my basic white everyday plates with fancier salad plates. 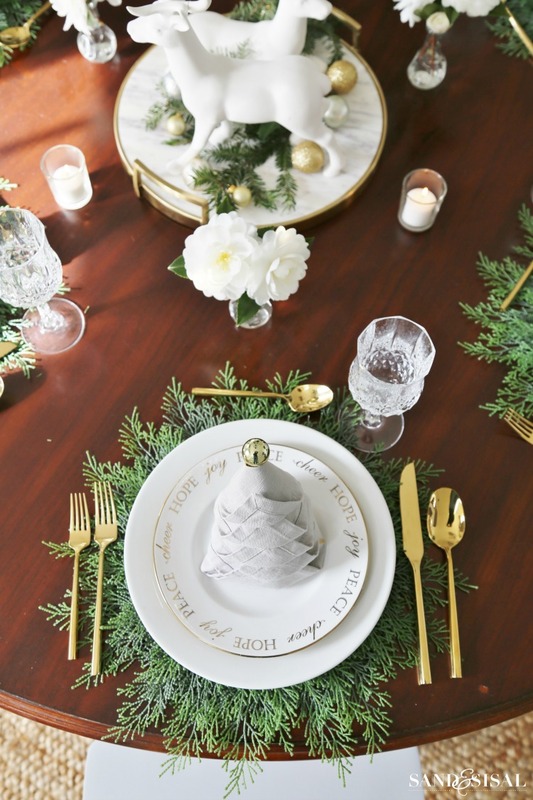 These pretty little gold scripted holiday plates are from Pier 1. Cut crystal glasses add so much sparkle and shine to a table. These were an amazing thrift store find. But I bet most of you are wondering about the Christmas Tree Napkins! Aren’t they adorable? They are so easy to fold. Click here for a video tutorial: Christmas Tree Napkin Fold Tutorial. 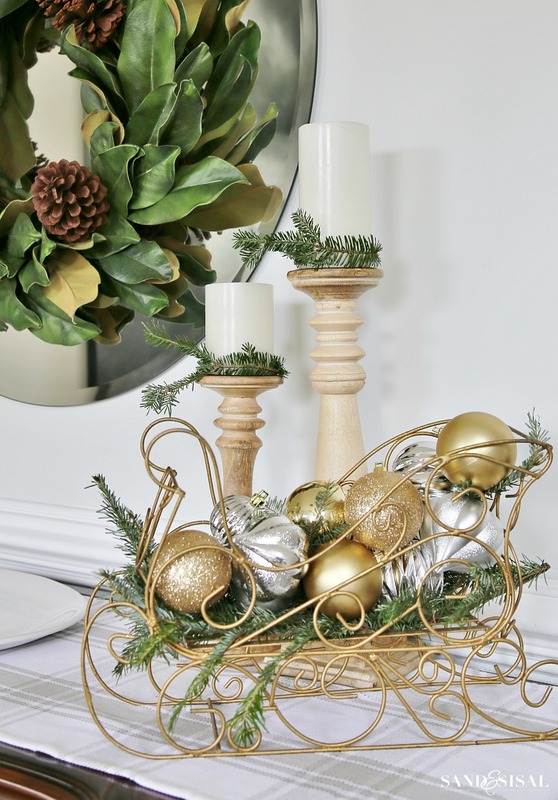 The holiday centerpiece was quick and easy to put together. It is a marble and gold platter with two porcelain reindeer I’ve had for years and a scattering of ornaments. Little dollar store votives and white camellias cut from our yard surround the centerpiece. They start blooming in October and bloom all through December. The bushes are loaded an are simply gorgeous! 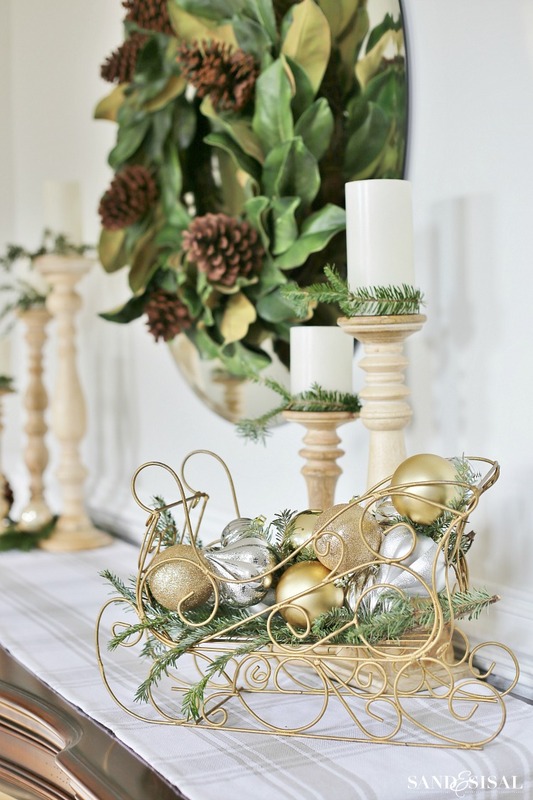 Again, with keeping the decor simple, I filled a sleigh with ornaments and hot glued evergreen sprigs to form rings which slid over the candle pillars. 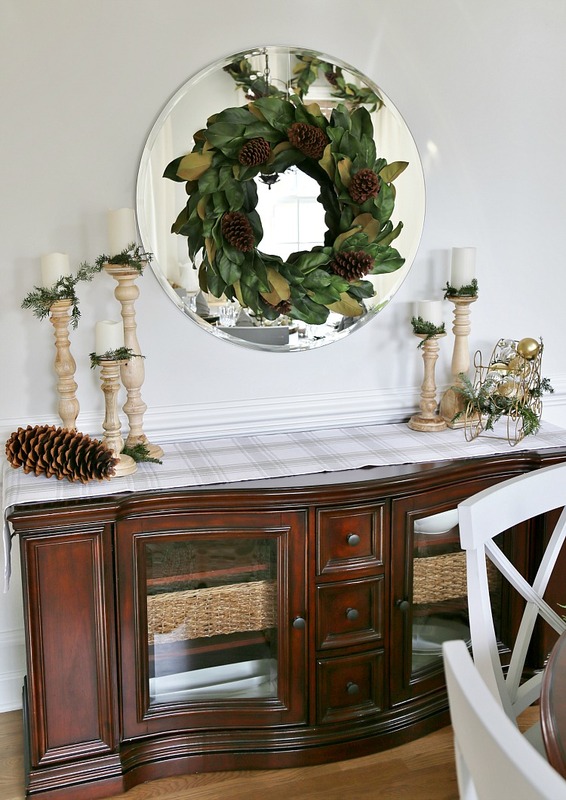 My favorite addition to the Christmas decor this year is the magnolia wreath and some magnolia swags. Magnolia trees grow everywhere here in the south. I’m hoping to one day plant a magnolia tree in our yard so that I don’t have to raid our neighbors tree! The magnolia swags were draped across the windows. Here’s an easy tip: Use zip ties to hold the middle of the swag to the window hardware to create the double draping. Enjoy this little animation of how I put together a holiday placesetting. The table is styled and set and ready for entertaining! 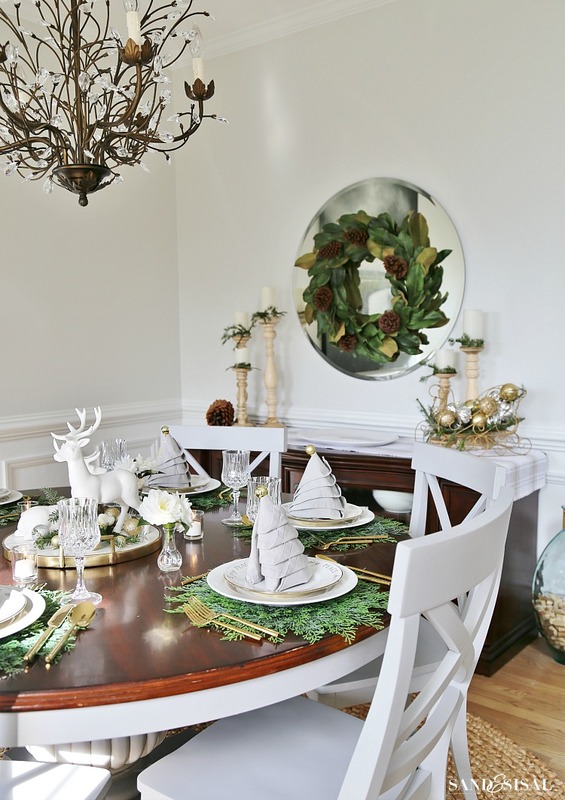 I hope you enjoyed my Christmas Dinner Tablesetting Ideas! Be sure to check out all the other ideas on the tour today which are listed below. Next on the tour is Town and Country Living. This is spectacular!!! Love every detail …those placemats are so pretty, I saw them online but they look so much better in a “real” setting…bravo! Thank you so much! They do look much better in the setting than the pic online. 😉 Thanks so much for stopping by! Very lovely but I want to know how you folded the napkins into Christmas trees? 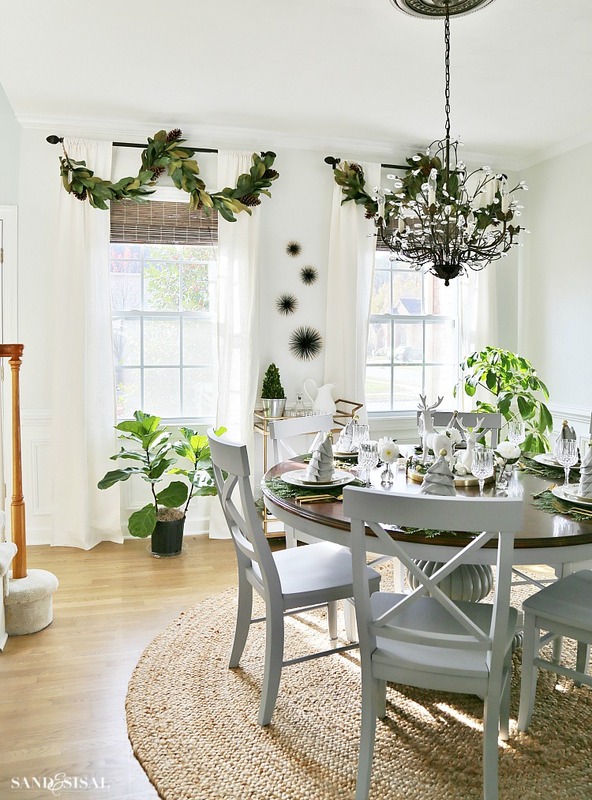 Kim, your color palette is so refreshing and simple, yet beautiful and festive! 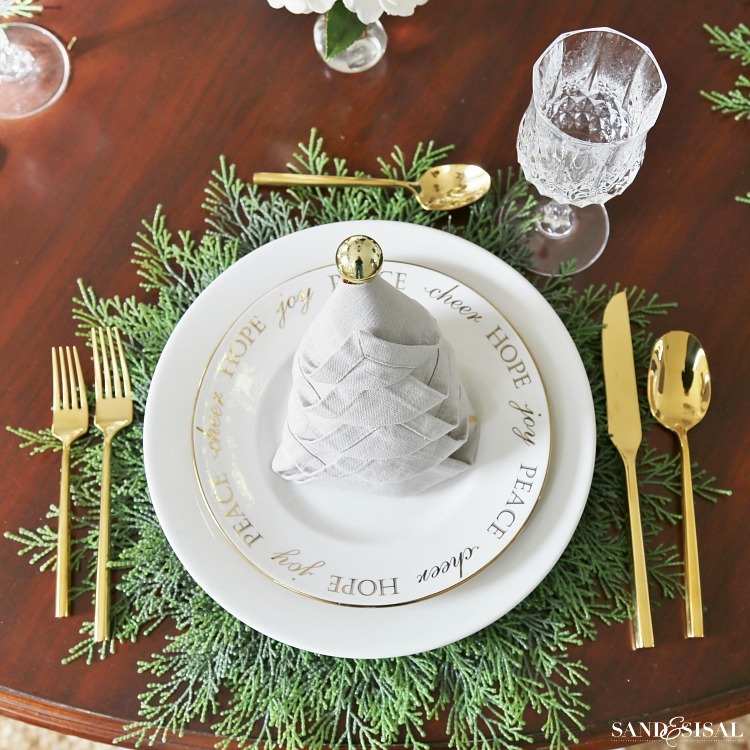 I really love all the greenery tucked in with the white, gold and silver and the placemats are fabulous! Wonderful table!! Thank you Lory! And thank you for organizing this beautiful blog tour! 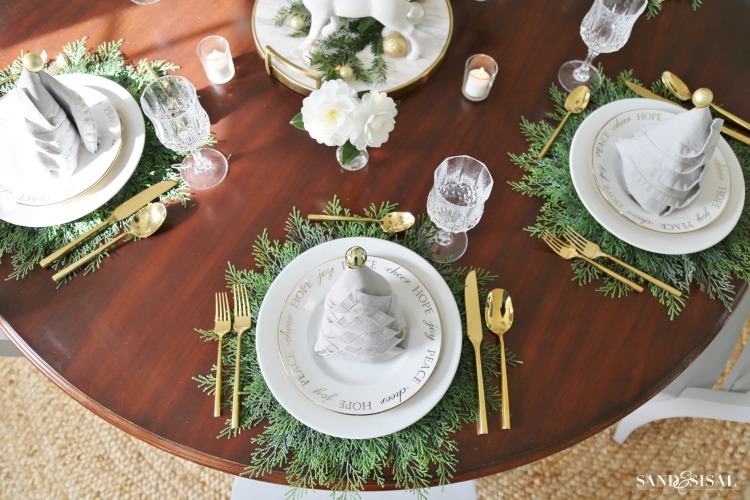 Love the white, gold, and silver with fresh greenery look on your table! So elegant yet inviting! The magnolia swags are fabulous too!!! Thank you Jennifer! I’m loving the magnolia swags too! Such an elegant and natural table. I love how you set the table using greenery instead of linens. I love the Pier One plates, had my eye on them this year as well. So pretty! Hee,hee,hee! Yep! They are faux! Aren’t they awesome? They looked kind of tacky online but I took a chance and I’m so glad I did! Thanks so much Amy! Omigoodness, I LOVE those place mats! 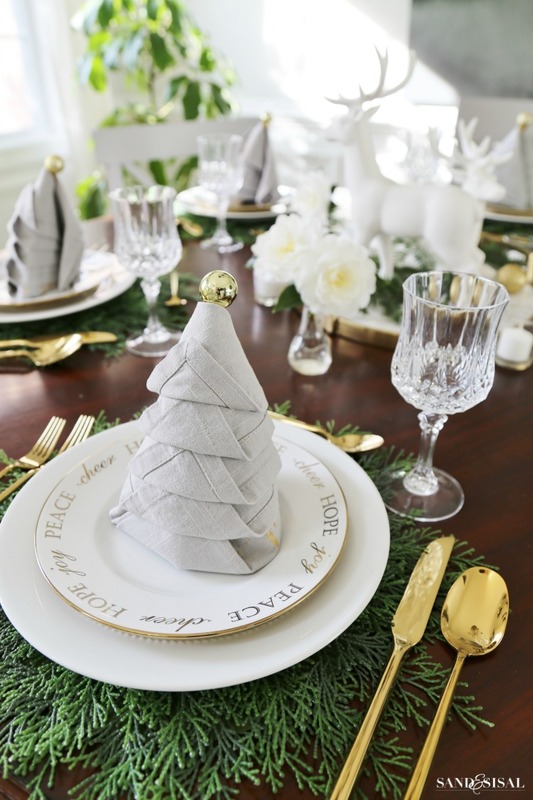 I’m also a huge fan of the art of napkin folding and your Christmas trees at each plate are just adorable! Stunning and so inviting!! !Somehow elegant and simple together! 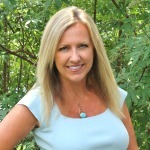 Kim, I love the metallics paired with all the fabulous greenery! Those place mats are amazing and so is your marble tray! Beautiful table! Love it Kim – those window swags particularly caught my eye! 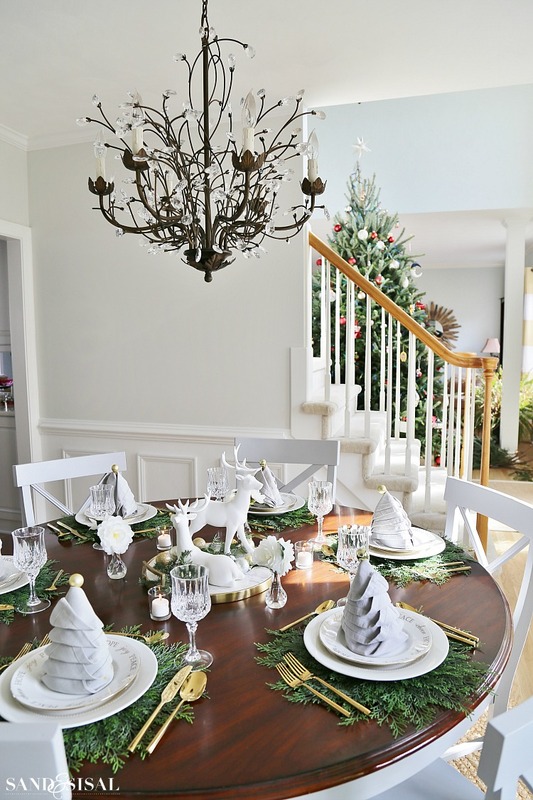 What a lovely table – I adore those Christmas tree folded napkins and actually have those same placemats – they’re great! Thank you so much Kris! They are fun little placemats aren’t they? So gorgeous! I love those cedar birch placemats. I thought for SURE they were real! Gorgeous table setting!